In the prevailing musical climate, thriving largely on complacent superficiality and unvarnished purposelessness, one seems hard-pressed to name more than a handful of artists whose work possess genuine appeal that is both anchored firmly in the here and now, yet rising beyond mere worldly considerations. To any one aspiring artist, finding one's true voice as a composer in a niche genre is indeed formidable. How does one go about recognising true merit in one's own ouvre and that of others without succumbing to the temptation of being either too finicky and dismissive, or -- worse yet -- far too easily pleased? Admittedly, the task is unenviable and not at all without its pitfalls -- daunting enough for a regular music enthusiast, let alone an independent, if highly accomplished, artist. Santa Fe, New Mexico-based ambient composer and photographer Brian McWilliams, currently releasing thought-provoking music as the fairly elusive entity Aperus, more than rises to the occasion in this extensive three-part interview, readily agreeing to probe the nature of "Lie Symmetry", discussing his early influences, perennial favourites, his electronic music pioneer namesake to relatively obscure new projects, dwelling on the niceties of studio equipment and environmental concerns that alike inform his creative flow, reflecting on the increasingly worrying developments in today's music industry, while also fondly expressing his abiding passion for traversing the Southwest heartland. All this he does politely and eruditely, in a tone that bespeaks unfeigned human warmth and admirable unpretentiousness, a precious rarity nowadays. Daniel: While your music does fall within the wider ambit of 'ambient', 'electronic' or 'experimental', it has never been quite easy to describe in more specific terms. Not content to dwell squarely within pre-determined confines, it has invariably sought to eschew clear-cut definitions, straddling genre borders and maintaining rather an air of sustained unpredictability. Is this quality - as I perceive it - pursued purposefully, or does it emerge entirely spontaneously? Brian: I've always found it difficult to navigate genres both as a listener and creator of music. Ten to fifteen years ago, you could walk into a Barnes & Noble and find Vidna Obmana sitting in the "New Age" bin which seems like a mismatch. Genres are now more varied, but they still feel rather rigid and unsuited for this type of music. As far as categorizing my own music, it depends on the album. With "Lie Symmetry", I wanted to explore new sounds and techniques and set a goal of ignoring genres when creating it. Maybe the album is a little less focused because of it, but I needed to find new areas to explore while pushing my technical ability. I would say it could be categorized as Ambient, Electronic, Environmental, Experimental or Drone depending on the song. For me there has definitely been a struggle to break free from labels and boxes. I've noticed this occurring in at least three areas: (1) copying your heroes, (2) trying to fit into a genre and (3) making music that other people will like. Though these may appear as internal and external pressures, I think it's crucial to listen to and nurture your own creative voice. Daniel: I have noticed your work as Aperus being qualified as 'Organic Ambient' of late. Presumably, the adjective organic is used to mean 'natural', 'naturally developing or occurring', 'unfeigned'. Given the complexity of the task of composing, arranging, recording and editing music of this type - which entails no small degree of calculation and premeditation, felicitous accidents and whims of inspiration notwithstanding - do you find this a fitting description, or something of a misnomer? Is it in any manner limiting, misleading or perhaps rather too vague a label? Brian: Yes, when promoting your own work, one tries to find the right code words to describe the sound in a way that's both unique and familiar enough to capture the audience's attention and curiosity. In regards to ambient music, it is entirely possible to create deeply meaningful work relying solely on electronic instruments and keyboards. In my case, I rely heavily on samples recorded in the environment or from hand played instruments and objects to make up part of my sound. To me this feels like an organic process that I can claim as part of my musical vocabulary. Daniel: Environmental is another descriptor occurring in recent reviews of "Lie Symmetry". Although I recognise genuine concern for preserving nature permeating all your work - in an understated manner and without ever descending to campaigning and partisanship, I take the term environmental rather to refer to one's surroundings, i.e. the climate and/or the architecture, as a shaping factor. Brian: Yes, "environmental" is another label that feels accurate when I try to describe my process and music. And this stems from a heavy reliance on field recordings made in nature and the surrounding environment that I live in and/or visit. Further, I would say that there is an underlying awareness that I carry with me that the sounds we grew up with, live with and love are gradually disappearing or changing. I'm aware of how precious these sounds are, and how fleeting the time we have to experience them actually is. I try to consider the sacred quality of time and sound when recording for an album. Anyone who gets out into the world with a recording device may be archiving sounds that are destined for oblivion and perhaps preserved only electronically. This is work of a higher calling and I try to listen closely and feel the environment deeply when moving through it. I'm also very interested to hear how other artists use field recordings in their own work. 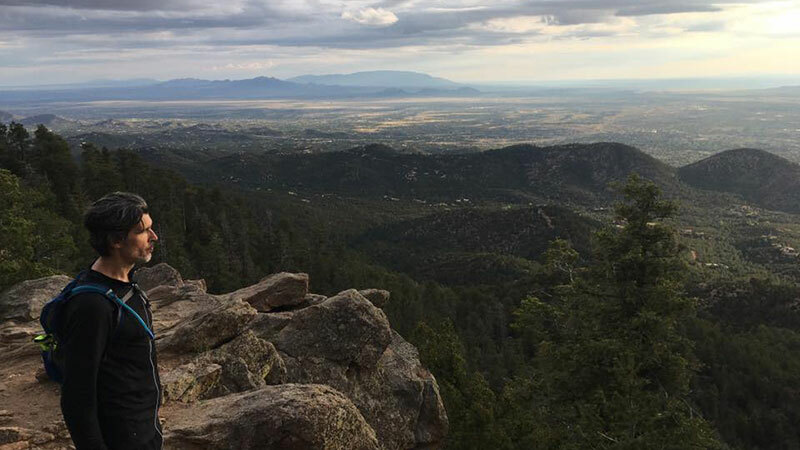 Daniel: If memory serves me well, you left the Midwest quite some time ago, quitting Michigan in favour of New Mexico and settling into a new life, which must have been something of a challenge at first. In view of this, I am eager to learn how your experiences have segued into your current musical expression. Has the arid climate of New Mexico had an adverse effect on your creative output, or quite the opposite? Brian: Interestingly, the artwork on my solo projects have been largely inspired by the Southwest while I was living in Michigan. As far back as "Tumbleweed Obfuscated by Camera Failure", I travelled to Arizona and New Mexico because I loved the landscape and found inspiration in the natural and historical fabric. Finally, in 2012 my wife and I were able to relocate to New Mexico and the move felt completely natural. I finally feel comfortable in my own skin and find artistic inspiration on a daily basis rather than once a year on short trips. I still found inspiration in the landscape in Michigan, but it was on a smaller scale and I had to look more deeply at the subtle nuances - perhaps it was the way ice formed during winter, or shadows were cast by plants. Now, I'm inspired by the light, the larger view, and the endless ways you can explore the micro as well. Daniel: On a related note, you seem to have a penchant for outdoor recreational activities, trail running probably being by far the most obvious and physically demanding. Climbing steep mountain slopes and covering great mileage on foot must be fully rewarding in themselves, yet they probably have an added benefit of bringing you into contact with the remarkable geology of those parts. Have monuments of weathering and erosion, canyons, buttes and tent rocks inspired you to compose music differently? Additionally, have the remains of ancient pre-Columbian archaological sites had an impact on your perception of time and space, art and spirituality? Does any track on "Lie Symmetry" in particular reflect your surroundings? Brian: When my wife and I first moved here, I was unsure how to go from sea level and flat terrain to 7,200 feet and rolling mountain trails. It was harder to breathe with more hills to climb. But we both adapted over time and I found running a great way to explore the deep recesses of the mountains and forests around us. This also gives me the opportunity to record interesting sounds on a regular basis. I often hike and run 30 - 40 miles a week in the desert and mountains and see amazing displays of landscape, weather, nature and ruins on a regular basis. This used to be a periodic experience (for vacations only) that I drew from for earlier projects and now it informs my work on a daily basis. In one way, it's always been there as distant inspiration but now it probably has a broader impact on the sound and not just the cover design. For example, on "Lie Symmetry" I was driven to find a way to make the album sound "warmer" and more colorful. Part of that was trying to improve my technique but I'm sure that the Southwest has triggered a psychological shift that's shown up in other ways too. Daniel: One cannot but remark on the visual aspect of Aperus, one that provides the ideal complement to the sound, making for an immersive experience. Your nature-inspired photographs do not strive after utmost optical clarity at all costs but rather run counter to expectations, focussing [pun intended] on shape and texture instead, bringing to the fore the subtle interplay between light and shadow, tone and mood. These soft, slightly defocused images, while admittedly an acquired taste for most devotees of conventional photography, have long come to lie at the core of Aperus appeal. I myself find them highly evocative of the style of album covers championed by the inimitable German jazz label ECM Records or the wildly experimental British ambient label Touch. Would you say such comparisons are appropriate, perhaps even flattering, or do they belie your work's true character? Brian: Thank you so much for saying that. A friend pointed out that the artwork for three Aperus albums were derived by accidents. I had never thought of that before - but it's true. I really do enjoy how chance and accident can play a part in creativity and now welcome them as collaborators. I used to fight it and tried for perfection and grew frustrated, but now I embrace it when taking photos, working with sounds, or music. Intention is great as a driving force but it can get in the way if we ignore compelling ideas that occur without our prompting. The world around us, the people we interact with, the tools of our trade - they all have their own energy. It's useful to consider that these outside energies may serve a higher purpose in our creative process. These comparisons are flattering, though I haven't followed ECM or Touch's output closely. Whatever I have done thus far with photography has pretty much occurred without me emulating any particular style and following my own muse. Daniel: Also, is photography - music aside - your preferred outlet for creativity? Have you considered, or been approached about, producing album covers and booklets for other like-minded artists? In addition, what typographical choices worth mentioning, if any, are part and parcel of your design process? Brian: I find music to be my preferred outlet but the amount of energy required is exponentially higher. Photography usually happens quickly and spontaneously while I'm out doing something else and if I find something compelling, I'll spend time focusing on it. I wish I could work more like this with audio. Creating sound is relatively easy - creating good music is incredibly difficult. I'd be thrilled to offer my photography to other like-minded artists for their album covers. It hasn't happened yet. I'm hoping to put some galleries together within the year to make that possible. I find typography to be the most difficult aspect of putting an album together. In most cases, I've found it perplexing and never seem to be completely satisfied with the outcome. I have huge respect for artists and labels that do it well. 4ad and 23 envelope created amazing typographic work back in their day. It's easy to feel discouraged when comparing your own work to that of a professional agency who were on the bleeding edge of such visual innovation. Daniel: In view of your many commitments and pursuits - each likely placing demands on what precious time you have available to yourself, how likely are you to be found obsessing over studio equipment? Is it something you tend to discuss with fellow enthusiasts and gear fiends only, or can it be a subject of ordinary conversation and friendly banter too? Do you strive to upgrade your studio equipment on a regular basis, investing in new instruments, hardware and software? Also, is the Sound Observatory your true inner sanctum, so to speak, where you can afford to compose and record music at your convenience? Brian: I love researching synthesizers and software, reading reviews, watching videos, etc, but honestly have very little extra money to buy them with. When I lived in Michigan, I had a recording studio full of keyboards, modules and a large mixing board. When we decided to move to Santa Fe, I knew we'd have less space so I sold 75% of my gear and kept the pieces I used the most. Very few people understand music gear so I only discuss it with music friends. I don't update on a regular basis though. Sometimes old gear goes further or has the most value. I do keep some software up to date such as my main composing tool, Ableton Live. I wish the Sound Observatory was a permanent studio - it just happens to be the space that's available at the house we're renting at the time. The past two years has been the best, because the room is large enough and rectangular and sounds quite good when recording and mixing. It's also far enough away from other houses that noise is not a concern. Hard to find all these qualities in a room. Sadly, I must make money doing other things so I struggle to find free time to create music. Daniel: On a related note, one cannot but notice the still popular Roland Juno-106 analogue synthesiser listed in the "Lie Symmetry" album booklet credits section. It has famously been put to good use by artists as diverse as Vangelis, Tangerine Dream, New Order, Depeche Mode, William Orbit, Biosphere, Apollo 440 and Autechre, to name but a few. How partial are you to it yourself, Brian, and how integral to the recording process was this particular instrument considering the delicately understated nature of the album? Brian: Oh, that's great that you noticed the Juno 106 in the credits and connected it to these other artists. The Juno is likely the first synth I had contact with back in the days when I played bass in an alternative band. At the time, our keyboard player owned the Juno 106 and I quickly noticed it was good at making moody pads and noise if you pushed it in the right direction. I ended up buying his Juno and it always seems to find a place on Remanence and Aperus projects. I wouldn't say it's integral to my sound (like sampling), but I do use it frequently and sometimes it's the only synth that can create the warm pads certain songs call for. On "Lie Symmetry", it appears on "VLA 1", "VLA 2" and the closing track "Unfrozen, Unbroken" As the song reaches the middle and gradually fades, you can hear the warm tones it's capable of producing. Daniel: May I enquire who your enduring influences - musical or otherwise - have been since the inception of Aperus onwards, and how these influences were brought to bear on "Lie Symmetry" specifically? I suspect a very comprehensive list of all-time favorite ambient/electronic albums like you published earlier this spring, which acknowledged the importance of Brian Eno, David Sylvian, Lustmord, Robert Rich, Steve Roach, Alio Die, Oophoi, vidnaObmana, Biosphere, and William Basinski is perhaps rather self-explanatory, but please do enlarge upon the points made in that very list. Brian Eno for me is where it all started. I discovered his highly regarded, oft written about album "On Land" when I was in high school. I have no idea what compelled me to pick up his cassette from the bin at the local general store (or why it was even there) but the artwork caught my eye and for some reason I had heard of him - even though I lived in the isolated northern town of Alpena, Michigan. To this day, this album still sounds incredible compared to work released 30+ years later. It has such atmosphere, depth, richness and feeling. I always thought the animal / insect sounds were created electronically. However, that's incorrect. Released in the early 1980's, "On Land" is also the first ambient album to feature field recordings and thus the first environmental ambient album. Any time I use a field recording on a song, I think of Brian Eno - he was the first. So, "Marsh Lake" is connected to "On Land" in my mind. I consider David Sylvian a god like figure in the world of instrumental music and he's someone who's worked two angles throughout his career - releasing vocal art rock albums with highly regarded innovators and dabbling in instrumental music along the way. Side 2 of "Gone To Earth" is monumental work - well structured and thought out instrumentals crafted with the highest level of playing. Also, his two albums with Holger Czukay are great - "Plight and Premonition" and "Flux and Mutability". I'd also highly recommend "Approaching Silence" and "Alchemy - an Index of Possibilities". I owe a lot of musical discoveries to my partner in Remanence, John Phipps. He always knew more about music than I did (he worked in a record store for years) and was always floating albums my way. Through him another world of music opened up and because of him I discovered 4ad bands like Dead Can Dance, Clan of Xymox and This Mortal Coil as well as darker influences such as SPK and Lustmord. Believe it or not, he also introduced me to Steve Roach, Robert Rich, Alio Die and Vidna Obmana. Getting back to influences, all these references were hugely important. The artists on 4ad had a massive impact due to the artwork, presentation and the way the music showed great restraint while striving for something transcendent. What is resonating now? I have been deeply impressed with the work of Biosphere especially "Substrata", "Cirque", "Shenzhou", and "Dropsonde". "Substrata" was a revelation when I first heard it: deeply emotive, adventurous, composed, deliberate and sounding like nothing else at the time. Further, he has his own thing going when mixing and mastering. Listen to how compressed the mids sound on "Subtrata" yet it still sounds amazing! Another detail I found intriguing was his use of jazz drum loops on the album "Cirque". Earlier, I said it was important to find your own voice and not copy your heroes. Now I'm reversing course. Occasionally, you may see or hear something new that resonates deeply, that's worth exploring, to find out how it works and perhaps add it as a technique or detail to your own set of brushes. That was the case here - I needed to throughly explore this. The results can be heard in the jazz hi-hat patterns on 'VLA 1' and 'Himalaya'. This turned out be an essential color for these two tracks. I still can't quite shake the work of Alio Die. I love how simple and forward he keeps his sound and always liked how he loops environmental recordings. If I made an album as good or strange as "Door of Possibilities" I'd be happy. Alio Die teaches you to simplify your mixes and keep things uncluttered. What can you say about Steve Roach that hasn't already been said? He's worked in so many different subgenre's that it's hard not to be impressed by something he's done. I tend to lean towards his darker work like "Midnight Moon", "Magnificent Void" and "Sigh of Ages" or his longform works like "Immersion 3" and "A Deeper Silence". I think Steve's one of the few ambient guys who's entire life is centered around the care and expression of his creative process. Further, he and Lustmord probably own the long reverb tail. No one does reverb as well as they do. Whenever it shows up in my own work (like at the end of "Marsh Lake"), I have to acknowledge them. Another guy that deserves my praise is Robin Storey of Rapoon and before that Zoviet France. I picked up his trail roughly around the time of "Fires of the Borderlands". There's something so melancholic about the way he assembles loops and lo-fi sounds from a slightly disinterested distance. Yet, I find his work extremely engaging and compelling. His discography is massive so it can be intimidating trying to find your way in. If you haven't already, check out "Fires of the Borderlands", "Monomyth", "Darker by Light", "Fallen Gods" and "Raising Earthly Spirits". Go back further in time and listen to Zoviet France's "Mohnomische" and "Just an Illusion". Over time I've become more interested in this lo-fi sound and the charm and atmosphere conjured when the technology and technique are limited. When I stumbled upon the beginnings of "Ephemeral River" I thought it kind of sounded like Rapoon. I kept returning to the simple core idea for this track and resisted embellishing it as a result of the audio trail he left behind. Last but not least is William Basinski. I discovered "92982" through a review and fell in love with his sound. He attributes much of it to the deterioration of old tapes but I suspect he's mastered the technique of making his recordings sound weathered and warm as a way to play on our sense of nostalgia. But no matter, his work proves that music that sounds imperfect feels better than music that's rendered sterile by too much computer software. I know we both share an interest in his music and I'm sure you'd agree that "the Disintegration Loops", "Melancholia" and "a Shadow in Time" are also great albums. Honestly, I don't think I've heard an album by him that I didn't like. Near the end of "VLA 2", I felt the song called for a gradual deterioration in "tape" quality in the spirit of William Basinski. Daniel: As an established recording artist - albeit within what is admittedly a niche genre - with a string of accomplished releases under your belt and high praise currently being bestowed upon your work from the likes of Steve Roach and Frans de Waard, do you still find the time to discover any budding artists or obscure record labels that might be far below the media radar? Could you name any that might have captured your attention of late through advancing pioneering ideas or at least stylistic shifts? 303 Committee - I only know of one proper album titled "s/t" which is noisy, edgy yet at the same time, incredibly well composed and put together. I wish there was more to explore from them. Aglaia - strongly connected with Alio Die, Aglaia has a great way with sound and atmosphere. His work sounds like incense for your ears. My favorites include "Ephemeral Blue", "Florealia Nocturna" and "Leaves and Thunderstorms". Andy Stott - probably not well known in ambient circles as most of his stuff is heavily beat driven, but his album "Luxury Problems" is edgy, challenging and brilliant. Atomine Elektrine - Side project of Raison D'etre, his album "Laniakea" shows how interesting sequencer driven music can sound when shifted towards the dark side. Council Estate Electronics - "Arktika" sounds like a throwback to the noisier beats, electronics and sound of 1980's Zoviet France. Love this release. Else Marie Pade - a female composer creating experimental music as early as the 1950's. Some of her work has been collected on "Electronic Works 1958-1995" and sounds like the blueprint for much of the experimental, electronic music we hear today. I would highly recommend fans of electronic music consider this release. The Field - "Looping State of Mind" is a classic beat/loop driven electronic album. A musical treasure. Gas - Wolgang Voigt's box set "Nah Und Fern" has been in heavy rotation here since it's release in 2008. In a way he defined a new sound with these repeating sound zones and deeply submerged drum patterns. Oophoi - The casual listener has probably never heard of Oophoi. Deep immersive sound zones from a true lover of the genre (previously occupation: musical journalist) that's definitely worth exploring. I'm sorry that Oophoi is no longer with us. Saul Stokes - abstract ambient electronic artist that I knew about for years but never explored. My loss because albums like "Abstraction", "Outfolding" and "Zo Pilots" are worthy additions to any collection. Great work from an artist with his own voice. Scott Cortez - released an album of long drawn out guitar ambience titled "Twin Radiant Flux". Gorgeous and moody from start to finish. Super Fata - I like most of his work and was deeply impressed with Structural Tendencies. I consider him a friend and he helped me a great deal on "Lie Symmetry". Thomas Koner - Love his use of restraint, sound, field recordings, etc. His work is top notch and sophisticated. Worth your time and money. Troum & Raison D'etre - Their collaborative album "De Aeris In Sublunaria Influxu" is one of the best I've heard over the last 10 years. Daniel: Do you think there may be bold leaps in the offing for ambient music in general? Brian: I'm honestly not sure about this. I think we're living in a challenging time when it comes to supporting music and artists while at the same time, technological advances have allowed more people to create and release their music. To break that down a little, I don't think music is valued at the level it once was by our culture or by the music platforms that are available. I hate to sound old fashioned but this shift occurred with the rise of chain stores, the internet, music steaming, and the possibility of sharing music across the globe for free. Record stores are disappearing and music fans can now collect as much music as they want for free without feeling much remorse (at least outwardly). I believe this devaluing of music creates an environment where there's less incentive for artists to create great music or pursue music in the first place. For established artists with a loyal following, I think it's still possible to make things work even with these broken frameworks. For others, we are forced into a position of considering our music a hobby. 1. Stream consciously - stream an artist you like A LOT! It takes a large number of streams for an artist to make money. Make a playlist with your favorite artist. Share the playlist with your friends. 2. Influence others - tell your friends about your favorite artist. Post your thoughts or reviews on social media. Encourage other people to listen. Saying something on social media goes further than clicking a "thumbs up". 3. Buy downloads - directly from the artist if you can or from iTunes, Amazon, and Google Play, etc. Even if you buy one song, it helps the artist. 4. Buy a CD, LP or cassette - directly from the artist or store. 5. Don't share music freely and unconsciously. Daniel: Thank you once again for sparing no effort in replying to my questions. I enjoyed reading your answers tremendously - immediately upon waking up this morning (my local time), so it's a Sunday well begun in my book! I think you did very well in summarizing your influences, providing a good bit of the telling detail yet keeping it relatively concise. I find myself ready to explore this territory afresh, even though I consider myself relatively well-versed in these matters. As I wrote in my previous message this morning, I'll be looking into the works of Rapoon (and some others) with great relish! The lesser-known artists recommendations make for rewarding reading, too. There are quite a few names I'm unfamiliar with, who need a great deal of research on my part. I'm so glad you mentioned Troum & Raison d'etre: their collaboration on the album you cited is superb, nothing short of astonishing. I wasn't aware of the Brazilian label Essence Music that released it, and now I'm so thankful for finding it. They seem to be fully committed to maintaining a level of finickiness that I admire, releasing only a small number of records a year, and assembling their products by hand (which also reminds me of you). Speaking of Raison d'etre, his three 1995 - 2000 albums are still probably my favourite dark ambient albums ever released. To me, he was the epitome of the style usually associated with the renowned Swedish label Cold Meat Industry, one of the most consistent industrial/ambient record labels out there, which is now sadly defunct. I'm not sure if you've checked out his more recent output since the demise of CMI. He's now on the Canadian label Cyclic Law, likewise fully dedicated to this artistic form. I found his latest album Alchymea very satisfying, the track 'Citrinitas' in particular harking back to his glory days. Troum are likewise well worth enthusing over, even if far too prolific (especially if one doesn't regard them as separate from Maeror Tri). By the way, have you heard a fairly similar collaboration album of theirs, entitled Mnemonic Induction (2002), recorded with the US act Yen Pox, one of the mainstays of Malignant Records? It's so thoroughly absorbing, almost otherworldly, despite an (over)abundance of dark ambient releases in the last twenty-odd years.While on the subject of Malignant Records, I found a recent newcomer to their ranks, one Leila Abdul-Rauf, a refreshing (and welcome) departure from all-out power electronics, harsh noise industrial and dark ambient. Back to the subject of the interview, I wholeheartedly support your (and other music artists) views on the state that music business is in today. Brian: I will definitely check out your musical suggestions. Listening to 'Mnemonic Induction' now and this sounds incredible. Daniel: We did touch upon the term 'environmental' for a moment. With that in mind, would you acknowledge any message - conventional or unorthodox - that "Lie Symmetry" is perhaps meant to convey? Even from a cursory listen, there does seem to emerge an underlying streak of environmental unease, or rather, of genuine concern for the natural world and its precarious future. Is this admonishing aspect something you set great store by? Brian: Yes, I hadn't really considered how this unease has crept into the album. And it's hard not to ignore what's happening around us. I chanced across the title "When the Mountains Wear Black Hats" from a Tibetan prophecy, described in an article about Zen monk Joan Halifax. I quote: "...Throughout the region, the snow and the glacial ice are withering away. Halifax recalled a Tibetan prophecy, When the mountains wear black hats, the world will end, and interpreted the black hats as the peaks without snow and ice. One day, some of the clear, cold streams and rivers flowing through upper Dolpo might dry up for part of the year, or stop entirely. The people who never had coal or electricity might be forced out of this place where the butter lamps are still lit before golden Buddhas in the old painted gompas, and where the barley is harvested by hand." Daniel: Speaking of the world left to the tender mercies of mankind, I found the title 'When the Mountains Wear Black Hats' to border on alarming. It happens to be one of the two songs on the album that I have a special preference for - I do like my ambient dark and fairly noisy, menacing even, but this song achieves that exquisitely without being overtly abrasive, dense or oppressive. Yet, for all its sombre overtones and pernicious undercurrents, there almost appears a desultory promise of cure, and the picture might not be entirely bleak after all - if nature's one final warning is ultimately heeded. Was this apparent duality intended from the outset, or is it merely a figment of my overwrought imagination? Please elaborate on the central thrust of this gripping, if rather short, composition. Brian: Thank you, this is one of my favorite tracks as well. The low notes were created using an ebow on electric guitar and the melodic chords that offset the darkness are not typical of my style. I make mental notes of interesting phrases, titles or stories constantly as part of my creative process so when this song was coming together, "When the Mountains Wear Black Hits" fit perfectly as a title. I honestly don't have much hope or faith in a cure for our future. I think there's a certain expression of grief coming through as a result. The song ends with the machinery grinding to a halt. If only I could have made that sound more forceful. Daniel: Another song that stands to capture any one deep listening music lover's attention almost immediately is the multilayered 'Marsh Lake, October'. More than any other track on the album, it thrives on field recordings from various locations and sources that you manage to splice together seamlessly. Its gradual build-up of tension is nothing short of extraordinary and oozes a distinctive cinematic quality in my book. Was it a challenge for you emphasising the cheerless vistas of autumn and the vicissitude of the seasons? Did the composition process present any technical difficulties that required scrapping unwieldy parts or needed major rethinking on your part? Brian: The album explores many angles, and this is one of my favorite. "Marsh Lake" explores the possibilities presented when combining field recordings that fit together geographically or by mood. I hope to explore more of these environmental soundscapes in the future. I also think this is one of the best songs I've recorded. It definitely owes a lot to Eno's "On Land" and the title pays homage to his album. In a way, I feel like it fell out of the sky and I didn't really have to work hard to record it. I also tried a similar experiment with "Leaves, Waves" on the first Aperus album with similar results. In both cases, the sounds were primarily drawn from field recordings. The trick is finding sounds that work together and create a cohesive soundscape. I tried to mix quickly from start to finish and then refined the panning and volume curves, following the initial mix as closely as possible. The most challenging aspect of "Marsh Lake" came from elaborating on the recording of the insects and cranes. The sample came from a mono mic and it took some effort to create a stereo image from this. Daniel: Were there any titles on "Lie Symmetry" that underwent radical restructuring in any manner because the original idea or motif had refused to take shape as expected - early promise not blossoming into maturity, so to speak? Are there any alternative takes of the songs that may yet find a home on another Aperus release, or morph into, say, a film score if given an opportunity? Brian: One song in particular refused to yield or bend and that was "Frozen, Broken". I recorded over 30 versions of it over many years. The problem was finding where each voice wanted to sit in the song. There are many layers and details so every time I returned to it, it sounded very dense while the elements needed to roll out more methodically over time. Different people gave me different advice on how to improve the song. Ron Sunsinger encouraged me to make more space and pointed out where I could reverse the bells to add variation. I think his suggestions made the song more interesting to work on in its later stages because I felt like I was out of ideas. During the final stages of mastering the album, Jason Goodyear suggested I replace the organ and add a cello part. I tried that too, but couldn't live without the organ holding the melodic direction together. There were about three tracks that didn't make the album and these are just demo names... "Psycho Acoustic Loop" was initially central to the project and I hope to return to it for something completely different because the core idea is really interesting. I recorded two different versions of it but couldn't pull the drums and bass together in either version. "Lost in Transition" was built from a two minute Berlin style sequence - it fit the album but I discovered noise in the recording and couldn't fix the core sounds so I gave up trying to create a satisfactory mix - strange how two minutes can sometimes seem more daunting than nine. There was also a third version of "Frozen, Broken" in the works but ultimately it just didn't add enough variety to the album so it was cut. Daniel: Other than receiving favourable reviews and eliciting positive response from the distributors in both the US and Europe, among whom Steve Roach may well be the most familiar of names, have you been approached about releasing "Lie Symmetry" through any of the specialist record labels, either long established or only just emerging? There still seem to be finicky independent labels committed to maintaining above-respectable, niche quality of their releases - witness the long string of remarkable albums on labels as diverse as. say, Cyclic Law, Glacial Movements, Essence Music or even Moving Furniture Records. Brian: Yes, I've been surprised by the positive feedback for the album, and Steve Roach's enthusiasm and encouragement in particular shifted my thinking on how I view my own work. If I were to summarize, he'd encourage all of us to hold our creative processes, whatever they may be, in high regard and to see the connection between the life we live and how it flows with our creative energy. A review in Expose also boosted my morale as the author picked up on many threads that other writers overlooked or did not see. I have been approached by a label to release my next album as a result of "Lie Symmetry" but am not sure what I want to do yet. It's very important for me to find a channel that can produce specialized packaging, has a specific audience and releases consistently high quality work. I am aware of and have deep respect for a couple of labels such as Glacial Movement, Type and Projekt but would like to consider a broader spectrum of possibilities for the future. This will require more research on my part, especially for the next album. Daniel: Do you feel being published by a label would somehow or other have you compromise your principles or narrow your vision? Do you still prefer to be your own man creatively and logistically, and be self-released as the Geophonic Records entity? Does this lend your music an air of exclusivity in a way? Brian: Yes, being on another label does involve compromises but could also provide benefits. For me, a label could greatly improve my chances of reaching a wider audience. If I could do that on my own, I probably wouldn't consider it at all. Daniel: Brian, have you any thoughts as to what lies in store for Aperus and yourself, respectively? Have you given yourself any short or long-term goals that you simply must achieve in order to prosper? Do current developments in life, technology, science, society and politics hint at a future bright or bleak? Brian: I'm currently working on three projects and am excited about all of them. Now, I need to keep my energy focused - any more than three and I suspect the process could collapse. 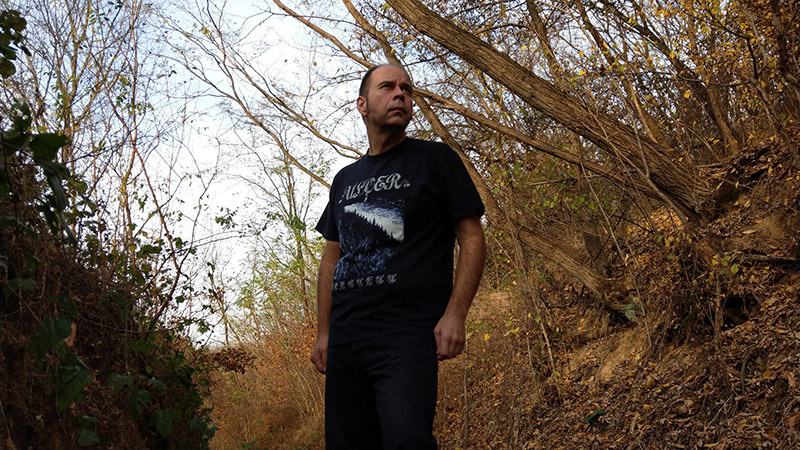 I can at least say that I am committed to finishing a Remanence project, am excited by the next Aperus project (I have a solid idea for its development now) and hope to release a dark, space ambient album in collaboration with another artist that I admire. Brian: I do think Santa Fe has had a positive impact on my development as an artist. Whether I will be known one day or not for my work remains to be seen. Ron Sunsinger, Michael Stearns, Julia Cameron and a whole host of other interesting people live here in addition to the names you mentioned. Santa Fe is a great place for creative people to share their ideas with other artists and to be inspired by the environment and culture. I really am surprised at how valuable it can be to be immersed in a community with other artists. I've learned a lot just from socializing and sharing my thoughts with some of them. Will anyone know my work? I hope so.